We specializes in unique, high quality cufflinks;Our design team creates cufflinks that will make your sleeves looks simply dazzling. Our inventory of awesome accessories will transform your entire wardrobe into a posh ensemble. If you want to get creative with your French cuff shirt, check out our cufflinks, novelty links and designs. Why choose Shang Zun Collar Stays/Tie Clips ? The mission of Shang Zun is to provide the high quality, stylish and healthy Collar Stays/Tie Clips for men's dress shirt. 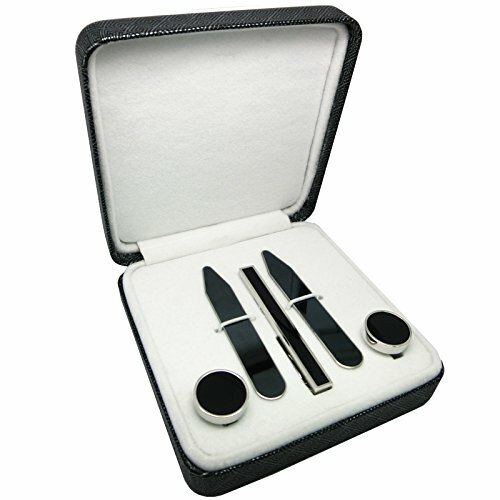 Packing include: 2 pcs collar stays + 2 pcs cufflinks + 1 pcs tie clip + 1 pcs Brand Gift Box. Size: Tie clip(2.16"×0.23"); Cufflinks diameter(0.59"); Collar Stays(2.2"×0.39"); Total Weight:150G. Black Gun Plated is a method of depositing a thin layer of black gun onto the surface of stainless steel. A deluxe gift box is included making these collar stays & tie clip & cufflinks a great gift idea. You can of course just treat yourself!